If you chose A, B, C, or E, bad news – you’re wrong (though you could make a case for E). If you chose D, then you’re correct. Computer Vision Syndrome (CVS) is shockingly widespread. Some studies have termed it the next office epidemic of the 21st century, and yet very few people have even heard the term. We’re willing to bet you’ve heard of carpal tunnel syndrome, and may have even taken steps to protect yourself against it. Carpal Tunnel Syndrome is a scary prospect, but only around 5% of people will ever have to deal with it. How about Computer Vision Syndrome? Few may know about the syndrome, but up to 90% of computer workers may suffer from it. Consider this our CVS public service announcement. Treadmill deskers and standing deskers are a pretty computer-happy bunch, so we’re here to tell you a little more about what CVS is and, more importantly, how to go about fighting it. Several specific causes lie behind these problems, but all of them are positively linked to one thing: computer use. Like many other similar, broad-spectrum syndromes (e.g. RSIs), Computer Vision Syndrome isn’t perfectly pinned down. It’s well documented, and extensively researched, but experts still differ on key details. And there you have your absolute basics. Now for the more important information: specific symptoms of CVS, and how to minimize them in your own workspace. Lighting is an unsung, but vitally important piece of the ergonomic pie. Office lighting is all too often neglected, and many workplaces have yet to catch up to the modern reality of a computer-dominated office. Installing powerful, overhead fluorescent lights is the most common approach – but it has a few serious flaws. While these super-bright systems are great for a paper-based operation, they’re not necessary for workers using a backlit LCD monitor. Even worse, they create excess glare. 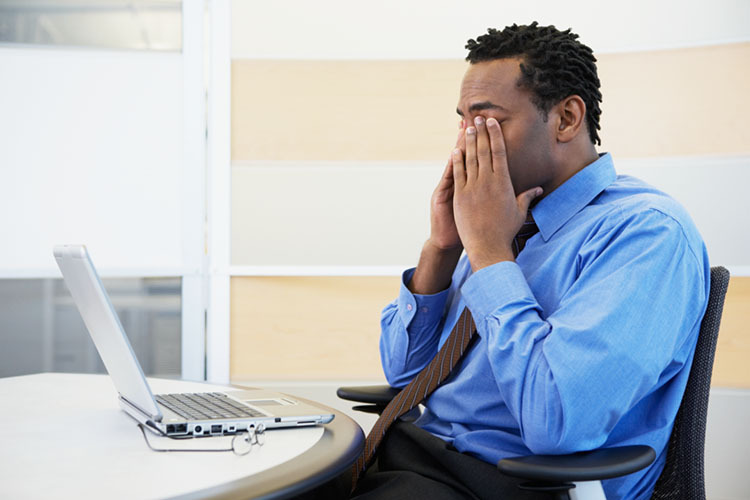 Not only does glare contribute to headaches and visual discomfort, it also encourages workers to assume uncomfortable positions. Hunching or leaning can help reduce glare, but staying in any unnatural position for too long dramatically increases the risks of winding up with a musculoskeletal injury. A complete overhaul of a lighting system is the best option, but also (go figure) the most expensive. Some companies have taken to using uplighting systems, which use lights directed toward a light-colored, matte ceiling, which disperses light evenly throughout an office. The resulting “cloudy day effect” provides even, shadowless, and glare-free light to a room. Cheaper, common-sense solutions also abound. Closing the blinds or turning off a few overhead lights can work wonders. There’s still debate over how useful anti-glare filters really are, but some folks swear by them and some studies back them up. This is always, always good advice. It’s widely known that taking a few breaks throughout the workday makes us happier, healthier, and more efficient. And of course, if you can get out and take a quick walk, so much the better. Turns out that getting a quick rest from your monitor does your eyes a world of good as well. Asthenopia. Say that 10 times fast. Now that you can pronounce it, we’ll go ahead and tell you that you’re probably experiencing it right now. Asthenopia is a major component of CVS, and occurs when the eye spends too long continuously focusing on a visually intensive task – like reading or working at a computer. Keeping that close focus for too long causes the ciliary muscles in the eyes to tighten, resulting in the set of uncomfortable symptoms commonly referred to as eye strain. Taking a break and focusing on a distant object helps relax those muscles, keeping your eyes fresh for longer. One handy mnemonic is the 20/20/20 rule; after every twenty minutes of work, take twenty seconds to focus on an object at least twenty feet away. Treadmill deskers should find this especially easy to work into their schedules. With apologies to Ben Franklin, we have to tell you it’s time to lose the bifocals. It doesn’t matter how distinguished they make you look, or how perfect they are for a relaxed evening with a novel. They’re downright hazardous for computer workers. Many users with bifocals tend to tilt their heads backwards to keep their screens in view, neck pain predictably ensues. Instead,glasses wearers should consider investing in a pair of occupational progressive lenses. These special lenses are designed with near and middle distance focus in mind, and are a tremendous boon to those suffering from presbyopia, or age-related farsightedness. Even standard progressive lenses help wearers avoid staring down their noses to work. They do come with an uncomfortable period of adjustment while a user finds the right part of the lens to focus through, but they’re a huge step up from standard bifocals. We can’t stress this one enough. Monitor arms are “optional” in the loosest sense of the word only. Buy a monitor arm, and you’re basically purchasing monitor adjustability. While simpler monitor stands are often height adjustable, they’re only addressing one aspect of the ergonomic issue. Height is crucial, but so is the distance between a worker and his screen. Finally, monitor angle is also extremely important. So, why angle? Dry eyes are both a symptom and a cause of CVS, and monitor angle and height heavily affect moisture levels in the eye. Think of how your eyes behave while you read a book. Hold your hands out in front of you, firmly grasp your chosen imaginary text, and pay attention to how you direct your gaze. Odds are your hands are now held at elbow level or below, and your eyes have accordingly adjusted downward. While reading in this position, the eyes are mostly lidded, and dry out extremely slowly. Now look back to your monitor – you’ll notice that as your gaze returns to horizontal, more surface area on the eye becomes exposed. Pair that with the computer user’s unsettling tendency to blink very, very slowly, and you have a recipe for dry, aggravated eyes. If you lower your monitor and tilt it slightly upwards, you’ll move back towards a moisture-retaining, downwards gaze. Conventional wisdom states that the center of a screen should be roughly 5-6” below eye level. Be careful not to hunch forward to adjust if you do choose to work with a lowered monitor, the value of keeping your eyes moist is easily offset by neck injury. Monitor distance is also important. While the old “arm’s length” rule is a decent place to start, it’s far from precise guidance. Many sources will recommend a viewing distance of roughly 26-30”, but there’s some evidence that keeping the monitor even farther away might be beneficial. Using a monitor arm lets you make all of these adjustments, and make them easily. Comfort is often the best ergonomic rubric, and finding your preferred monitor position becomes much simpler with a fully articulated support arm. So don’t skimp while setting up a screen in your workstation – you’ll be using it every day, after all.